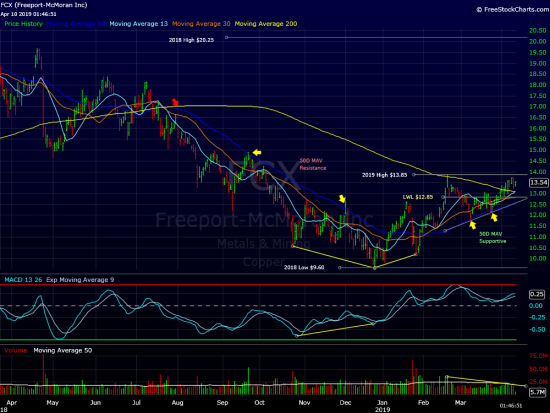 FCX is setting up well for a fresh rally leg. Heading for 2nd straight weekly close above the 200 day moving average(last time this happened-late July). Declining 50 day moving average provided heavy resistance following the August 1st breakdown. Upward sloping 50 day moving average has held multi week March lows. A close above $14.00(2019/Feb. high) could spark a powerful rally leg. On the downside, a close back below last week’s low($12.85) would indicate the 200 day moving average is still in control of the action. FCX is due to report earnings April 25th(AM).